You'll be £12.99 closer to your next £10.00 credit when you purchase Fighting for the French Foreign Legion. What's this? The author describes how he joined the French Foreign Legion, without being able to speak any French and very close to the age limit. He takes the reader through the vigorous selection procedure, the relentless recruit regime and then elite Second Parachute Regiment's training in Corsica. We learn about the ethos and strict discipline of the Foreign Legion. He describes his fellow legionnaires drawn from many backgrounds and nations. Having won his kepi and paratroop wings he served across Africa and the Middle East, taking part in Operation DESERT STORM (fighting Saddam Hussein's Republican Guard), peace keeping operations in Sarajevo and Bosnia and in former French colonies such as Chad and the Central African Republic. He graphically describes the action and appalling conditions of the local population. Accounts of life in the modern day Foreign Legion are rare indeed and this one written by a mature and modest man makes fascinating reading. A thoughtful book, and should be a good addition to anyones Legion library. The attractive cover gives you a fair impression of what you can expect of the book. It is a good length and set at an equally good pace, while its format is handy and light enough to be read in a comfortable armchair or out and about. The interesting image section serves also to reinforce the mental picture that Lochrie easily builds in your mind, comprising of photographs and beautiful illustrations, created by the author himself. An excellent read and something of a page turner. If the Legion is your thing, or you are interested in modern day soldiering then you will love this book. Lochrie has led a fascinating and fast paced life. After a stint in advertising, he joined the Glasgow police force, learnt to fly, attempted suicide and then spontaneously moved to Paris to join the French Foreign Legion, which took him all over the world. Lochrie's engaging and honest style tells a gripping and insightful story. This intriguing and revealing real life story, follows the journey of a thirty eight year old Scottish man who could not speak a word of French as he tries and successfully joins the French Legion, telling a few "white lies" along the way! However, against the odds he becomes an established member of the legion, fighting in various war zones and eventually earning the French Military Cross. Alex Lochries autobiography is an interesting, eye-opening account of bravery, determination and willingness to fight which makes this a unique edition to your collection and also one of only a few books written about the French Legion. 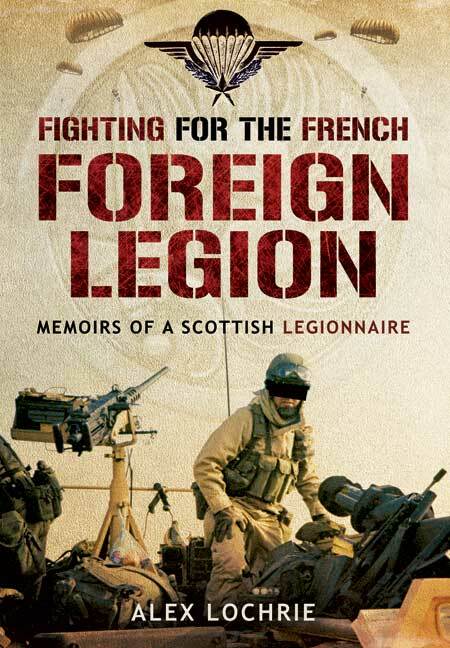 The air of mystique and fascination surrounding the activities of the French Foreign Legion has fascinated military historians throughout its long history as a branch of the French Army, and so Alex Lochrie's first-hand account of his life in the force in the 1980s is refreshing. His personal story is moving and atypical, and in light of this his eventual success becomes even more impressive and affective. The detail given in his accounts of selection processes and mission procedures is truly enlightening, but this is far from a simple non-fiction account of the history of the Legionnaires. Lochrie's style is truly individual, and there are few historical narratives in which you feel such a strong sense of the person behind the tale. He is outspokenly opinionated, and comments on all aspects of the war, from its participants, to the innocent civilians, to scathing criticisms of the distortion that politicians and journalists can encourage. Whether we agree with Lochrie or not, he is a persuasive character and, complete with a selection of photographs and his own pen-and-ink drawings, this is perhaps the most richly textured account of life as a Legionnaire that any enthusiast could hope for. Since 1831 the French Foreign Legion has been among the most famous military units on earth. The author takes us through training with him and on to operations in Africa, Iraq and The Balkans with graphic descriptions of all those conflicts. The book provides a gripping insight to one of the elite units of the French Army. Excellently told story on the professional life of a soldier, the special comraderie amongst legionnaires and the revealing facts on the mission to Sarajevo. I was spell-bound from start to finish! Alex Lochrie has had a varied and colourful career. He has been a Police officer, Forensic Scene of Crime Examiner, a commercial artist and a rally driver. After leaving the French Foreign Legion he started his own graphic design business. He lives at Troon, Scotland. Alex has published two novels 'Deadly Black Rain' and 'The Real Cost of Terror' which are available as e-books.